There is a nice side effect of wealth creation – some money spent on designer handbags could end up as a new museum. This is the case of a great museum opened in 2014 in Paris – Fondation Louis Vuitton. 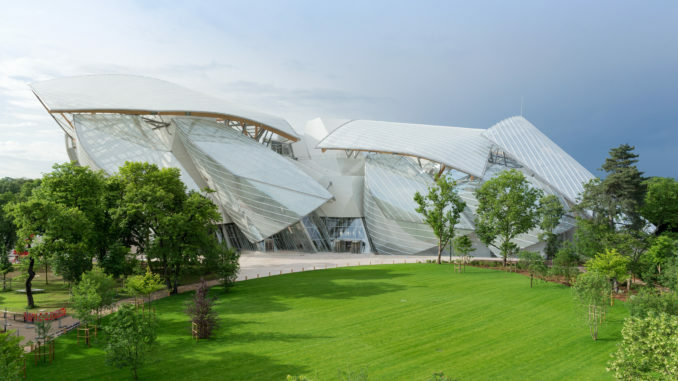 As the name implies, the luxury goods giant LVMH decided that some of the profit should be spent on art and giving back to the community, and one of the most spectacular modern art destinations was born. Los Angeles architect Frank Gehry was chosen to create a building that, at least for now, contributes to modern art perhaps even more than the actual collection housed within. Modern art is difficult to store and display – works are often monumental in size, some installations require audiovisual support, many are already created with institutions in mind because they cannot really be displayed in people’s homes. 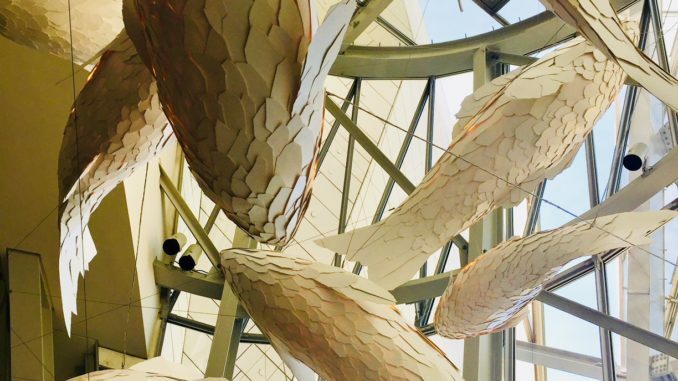 Therefore, any modern art museum that provides huge, well-lit spaces and spectacular outdoor spaces would be at advantage to showcase contemporary artworks and Fondation Louis Vuitton is an outstanding example. Here the architecture is the star on its own. For years, Gehry has been famous for his undulating walls (e.g. the Guggenheim Museum in Bilbao, the Las Vegas Clinic for Brain Health) and maritime themes (NY’s IAC building). These elements of his style come spectacularly together in this project – he was inspired by the voluminous sails of a sea yacht Susanne when he created enormous glass panels that jut forward from a pool of water. Modern architecture’s grand projects not only are products of advanced engineering and availability of new building materials, they also cannot be made without modeling software and digitization of each process of design and construction. Gehry’s design team and the French builders fully utilized new technologies in this project – for example the glass sails comprise of 200,000 parts on girders that have been customized for each position and function. The resulting building is not only a marvel of technology, it also has the lightness and poise of a three-dimensional “painting” of sails or billowing clouds or may be gigantic palm leaves. Paris has been in love with major glass roofs for a long time – the Grand Palais, which was built for the Universal Exposition in 1900, is roofed with an enormous glass surface that became instantly a landmark, other famous 19th century glass structures in Paris include the Botanical Gardens (Jardin de Plantes) and ex-train station and now the famous Museum d’Orsay. Gehry’s “glasshouse” roof is a modern variation on this theme but thanks to his expansive vision and modern technology, it is a breath-taking building that offers different vistas at every turn. Even though the museum has big exhibition halls, large sizes of contemporary art would make it impossible to keep the entire collection on display so Fondation selects various works to be displayed thematically in changing exhibitions. The latest, entitled In Tune with the World, presents various works and installations arranged in three themes. One group of halls is devoted to Takashi Murakami’s pop and manga style worlds: DOB, a figure that is his artistic alter ego and looks like a cross between Mickey Mouse and a toothy monster, a series of paintings where he is meshing Chinese mythology figures with Japanese pop art florals, and monumental panels with his characteristic, colorful Kawaii (“cute”) art. Another part of the museum presents various media (videos, installations, sculptures) around a theme of man’s relationship to nature and features works by Yves Klein, Gerhard Richter, Henri Matisse, Kiki Smith, as well as Pierre Huyghe’s intriguing Cambrian Explosion 10 (which is a strange pumice rock suspended in an aquarium). There is also a collection of works specially commissioned for the museum space: a yellow prism column installation by artist Olafur Eliasson, another one, a multicolored curtain by the famous abstractionist Ellsworth Kelly, also a giant Felix the Cat sculpture by Mark Leckey. This place is a happy marriage of bold and utterly modern architecture and a collection of 21st century art, with special emphasis on French artists. Paris is a city that boasts of more than a hundred popular museums. Fondation Louis Vuitton is perhaps not as known internationally as other tourist destinations but its landmark architecture and its contemporary art collection could eventually make it the place to visit in the City of Light.